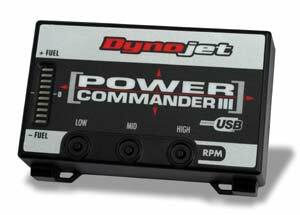 The Dynojet Power Commander plugs inline with your bike’s stock fuel injection system. It uses OEM (original equipment manufacturer) style connectors making installation easy and quick. The PCIIIusb allows a full range of fuel adjustment, as much as +/- 100% over stock. Adjustments can be made either with a Windows based computer or by using the face plate mounted button adjusters. No permanent changes are made to the bike’s system. Once the unit is removed the bike reverts to its stock settings. 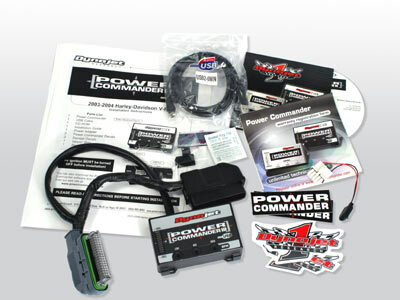 "Expansion port" for upgrades and accessories - The "expansion port" allows easy connection of accessories such as our new ignition module, Quick shifter, Multifunction Hub, Pressure Sensor display and LCD display unit. Automatic map retrieval upon connection - As soon as you connect the PCIII USB to the computer and launch the software, the map installed in the PCIII USB will be displayed. You may notice that we have a map specifically for "Brand A" slip-on exhaust and another for "Brand B" slip-on exhaust. Although the difference between the two maps is likely to be very small, these difference will increase the optimization for that given combination. If you have a "Brand C" exhaust and we do not have a specific map, you should find that "Brand A" or Brand B" maps will provide a good improvement on your bike. If you have a Windows 98SE/ME/2000/XP computer, you can upload alternate maps or make changes to the existing map using the Control Center software and USB cable supplied with your PC. (Detailed Software tutorials and quick reference software screen shots are available on the CD-ROM or web site).